The international and domestic players are all set to launch their iconic and flagship products by finishing a long anticipation time. Therefore, the Indian automobile field is going to become a witness of upcoming motorcycles that will be launched in the country in 2019 upcoming bikes in India under 3 to 5 lakhs. The forthcoming bikes are designed specifically to capture an audience. We have naked sports bikes and fully faired that look as machines. All products are expected to be lie in 300cc – 500cc upcoming bikes segment that is growing segment in the nation. DSK Benelli Leoncino is blessed with a totally different and unique design language. The motorbike looks completely stunning with its awesome rough looks given by the company and is expected to be launch in October 2019 priced at INR 5 lakhs. The upcoming bike is fueled with a 499.6cc twin-cylinder, liquid-cooled engine which is capable of developing the maximum power of 47.6hp at 8500 rpm with 45Nm of maximum torque at 4500 rpm. The engine delivers power to the rear wheel via a 6-speed gearbox. It is expected to be priced at INR 5 Lakh. Benelli, one of the oldest automobile manufacturing firm, is planning to lead the Indian automobile market with the arrival of its all-new DSK Benelli TRK 502 which is expected to be launched soon in the country.The motorbike is blessed with an edgy design language and fueled with a new four-stroke, liquid-fueled 500cc parallel twin-unit, with four-valves per cylinder. The engine is capable of developing a maximum power of 47 bhp and 45Nm of maximum torque. The upcoming bike is believed to be priced at INR 5 lakhs. Ducati is all set to target the Indian enthusiasts by launching it’s Ducati Scrambler Sixty two. This entry level bike gets a small displacement powertrain. The naked bike will be sold at the expected price tag of Rs. 4,75,000. It looks identical to the Scrambler series as it is wrapped around the Steel Trellis Frame. While we talking about the power of the bike, it gets a 399cc, L twin cylinder, air cooled engine which burst out 41 BHP at 8750 RPM of power and 34.6 Nm at 8000 RPM of torque. It receives the two-piston and a single 320mm disc brake in front and a single piston and 245mm brake setup at a rear end. It will be launched in the Indian market soon, so stay tuned to get more details about the Scrambler Sixty two. The Japanese two-wheeler maker is working on an adventure sports bike, Versys 250. The quarter-liter engine on the Versys 250 will be a two-cylinder, 8 valves, liquid cooled, fuel injected unit that will perform the power generation task on the motorcycle. The bike will produce, well over 30 BHp of power and torque closer to 30 Nm and also be paired with a 6- speed gearbox. The Versys may be equipped with an upside down suspension at the front and monoshock at the rear, a bigger windscreen to resist the airflow and a comfortable seat with an underbelly suspension for the lower center of gravity. The Kawasaki Versys 250’s expected price will be Rs. 3,50,000. The highly anticipated bike, Yamaha YZF-R25 is all set to rule on Indian roads. Likely, the Japanese firm will launch this bike after May 2019. The fully faired bike will be sold at an expected price tag of Rs 2.5 to 3 lakhs. It has a really impressive design with aggressive twin front headlights and its fairing. While talking about the powering of the bike, it gets power from a 249cc, twin cylinder engine that produces a maximum power of 35.5 BHP and 22.1 Nm of torque. The braking duties are managed by 298 mm floating disc at a front side and 220 mm single disc at a rear end. The bike gives a dynamic balancing power as it is loaded with 41mm telescopic suspensions at front and monoshock fork at a rear side. The Japanese renowned brand name, Yamaha that beats in the heart of the Indian enthusiasts as ‘Yes! Yamaha’. The firm is going to big bang this year in the domestic two-wheeler bazaar by lunching awaited MT flagship, Yamaha MT-03 at an expected price tag of 3 lakhs. The motorcycle would be imported to the country via completely knocked down unit (CKD) from Yamaha’s Indonesian manufacturing plant. It is based on the YZF-R3 in terms of cosmetics. The naked streetfighter is powered by a 321cc, parallel twin motor that churns out the maximum power of 42PS and a peak torque of 27 Nm. The twin-cylinder and a liquid cooled mill are paired with a six-speed transmission that uses to transfer the power to the rear wheels. When the bike will be launched then it will compete against the KTM Duke 390, Benelli TNT 300 and upcoming Kawasaki Z50SL. South Korean bike manufacturer, Hyusong is gearing up to launch a full faired motorcycle, Hyosung GT300R in India in June 2019 at an expected price tag of 3.5 lakh. The bike is based on the GT250R. It gets new fairing, lamps on both ends and newly updated exhaust. The bikes sport a new 275cc, 8 valve and V-Twin engine that develops 27.6 BHP and 23.5 Nm of peak torque. The balancing power is managed by 41mm USD suspensions on a front side and a monoshock fork at the rear end. The bike is featured with 300 mm single disc at a front side and a 230 mm single disc at the rear end. The Japanese giant is gearing up to add a new CBR series in its family by introducing a 500cc bike, Honda CBR 500R in June to July 2019. The motorcycle will be sold at an expected price tag INR 4 to 5 lakhs in our country. The middleweight bike was first showcased at the 2014 Auto Expo, Delhi. The CBR 500R gives a muscular look as it is featured in a bulky fuel tank. It has an aggressive stance. Its split seats offer comfortable riding to both rider and pillion. Engine-wise, the motorcycle will be arriving with a 500cc and parallel-twin motor that is expected to be produced a maximum power of 47 BHP and a vertex torque of 43 Nm. The Honda CBR 500R would be available in both ABS and Non-ABS. Overall, the bike will kill the audience by its stunning looks. The Hero MotoCorp, domestic motorcycle manufacturer was created a lot of hubbub at the 2014 Auto Expo, wherein new bikes were showcased. One of the most attractions among them was the Hero Hastur. The Hero India has engineered the bike with the collaboration of its partner, EBR. The motorcycle will be arriving by the end of 2019. It will be available at expected price INR 5 lakhs. It will be powered by a four-stroke, parallel-twin and 620cc motor that to be produced a maximum power 79 BHP and an utmost torque of 72 Nm. The upcoming Hastur bike will be developed on a yellowish trellis steel tube class with an aluminum subframe. 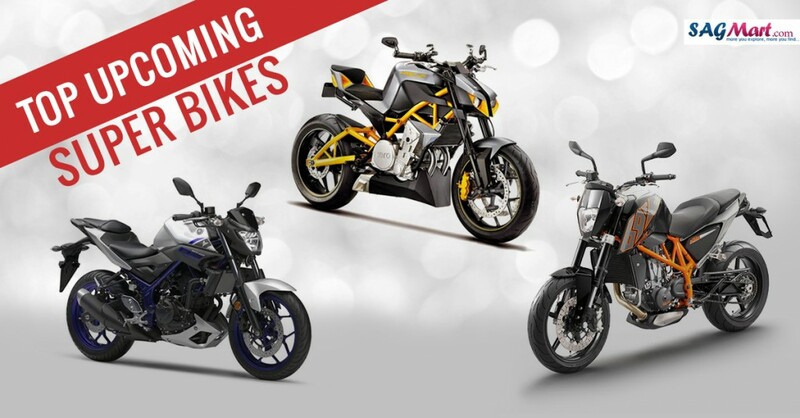 The upcoming bike will compete against the Hyosung GT 650N and the Ducati Monster 695. Bhai.. Hastur na ane wali. Ankit Sir, we have shown the bikes according to the company perspectives, so, depending on companies’ policy which bikes are upcoming? When it will launch in the Indian market.